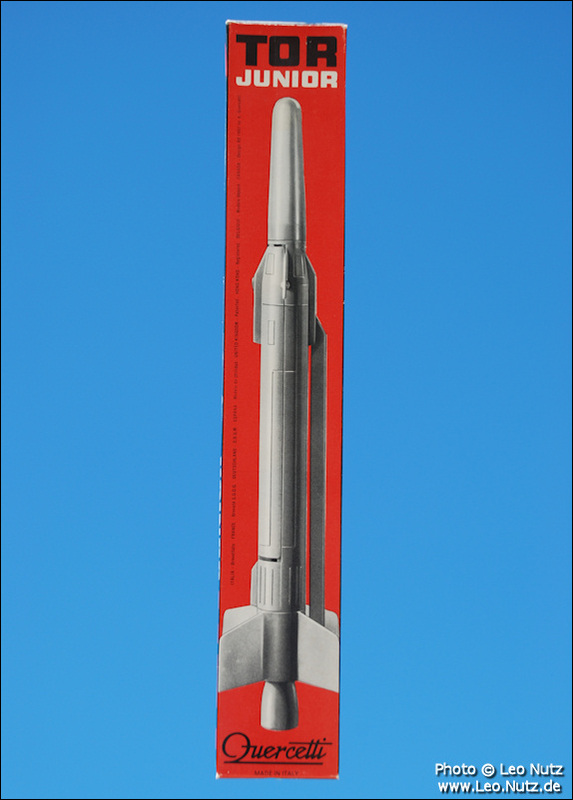 art work, pictures of the real rocket hanging on it's parachute. 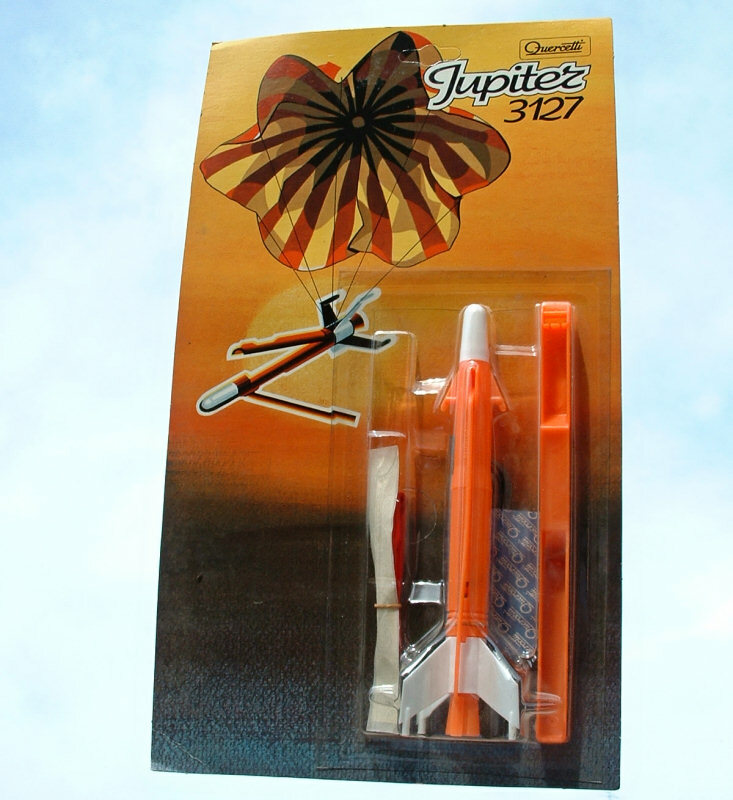 The first Jupiter issue featured streamer recovery instead using a parachute. This kit was made by Quercetti & C S.p.a. Turin, Italy. It is shot into the air via rubber band catapult. 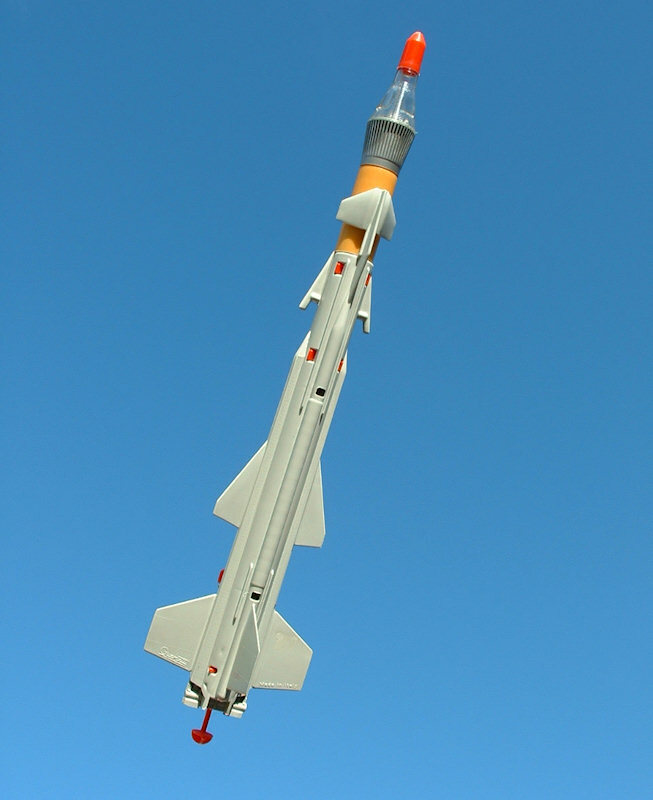 Flights up to 100 meters are possible. This kit was manufactured in the early 80's (3rd issue). and frames or white rocket with red ogive and yellow catapults. This was due to the availability of raw material during the production years. In the early 70's a blister packed issue with white rocket, red ogive was produced. It is extremely rare due it's short production span. Thanks to Filippo Messeri for the historical background. This sleek model has great detail in design and mechanics. It flies up to 600' and it's altitude is adjustable. 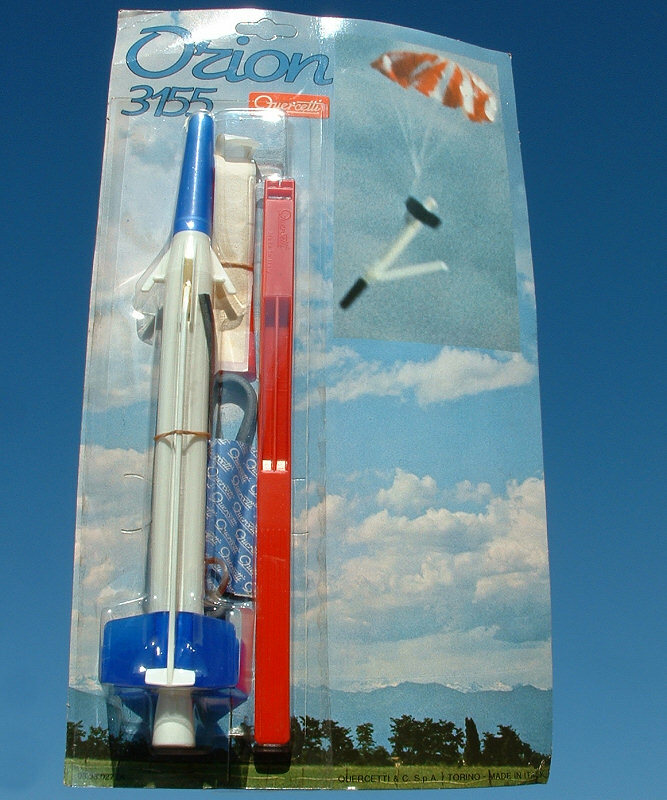 The rocket has dual parachute deployment. 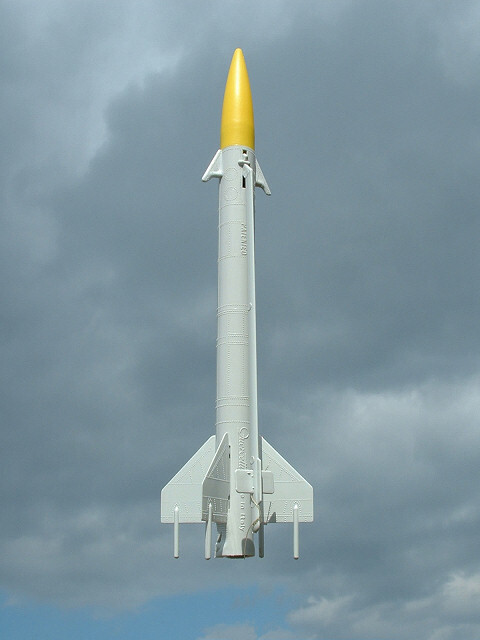 Both nose cone capsule and main body descend after apogee. 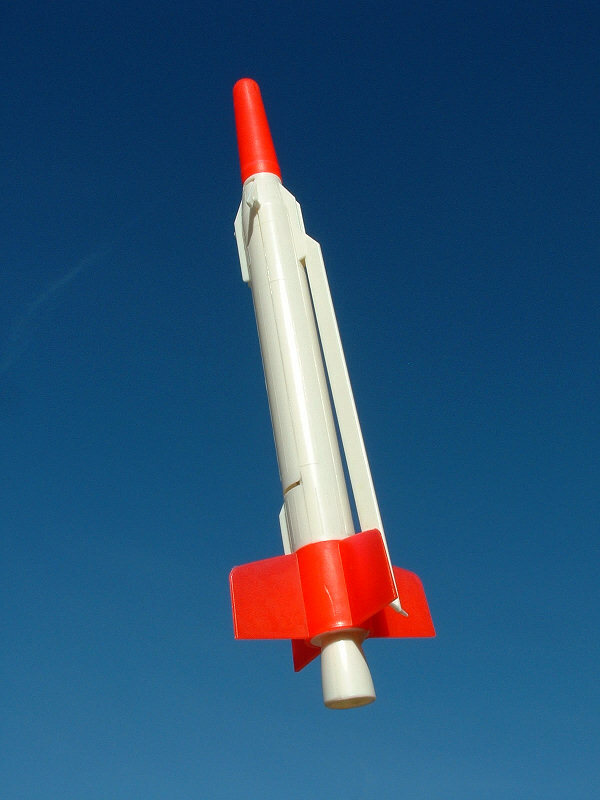 This is my favorite Quercetti rocket. 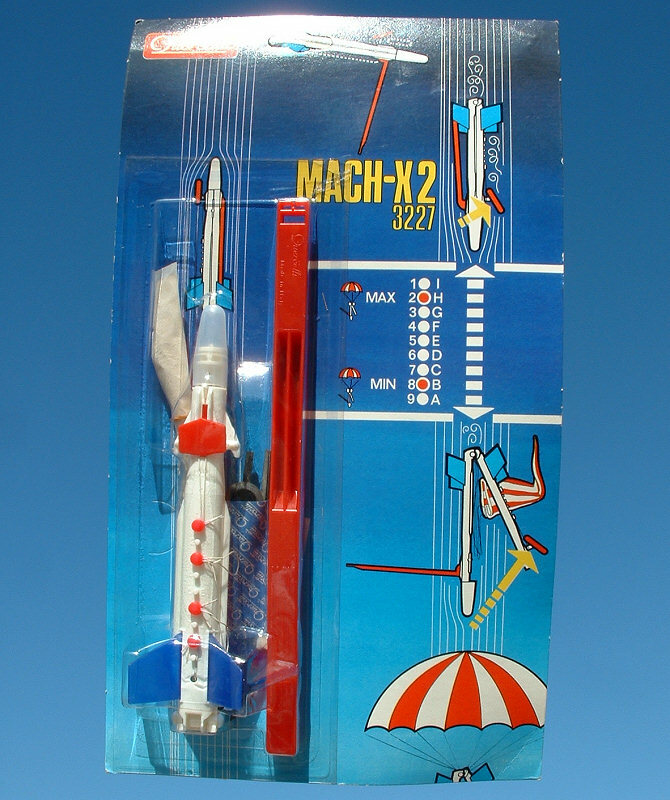 I'm willing to trade for other mint Quercetti rockets. 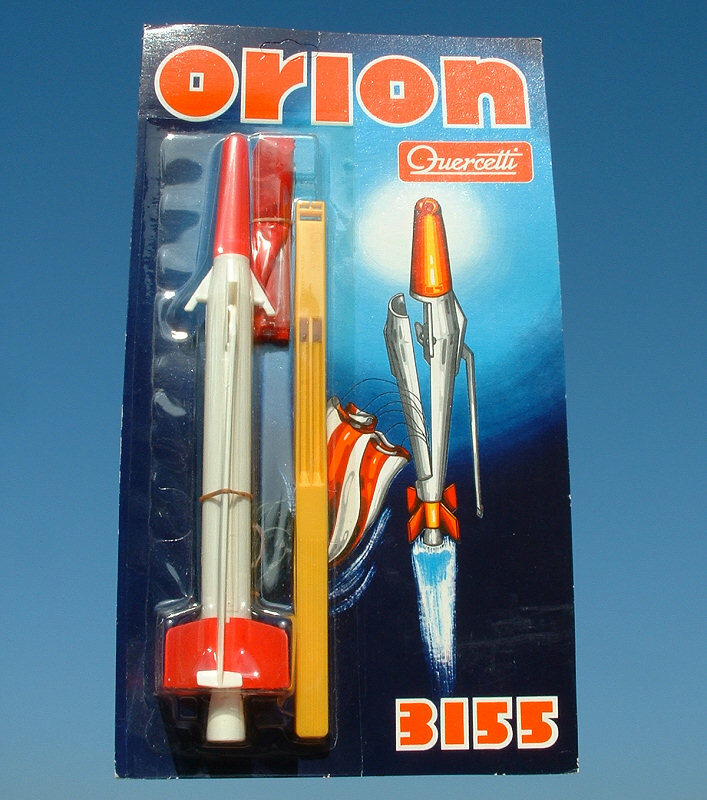 This is the first issued kit named "Orion". In the 60's it was named "Tor Junior". This kit was manufactured in the late 70's. 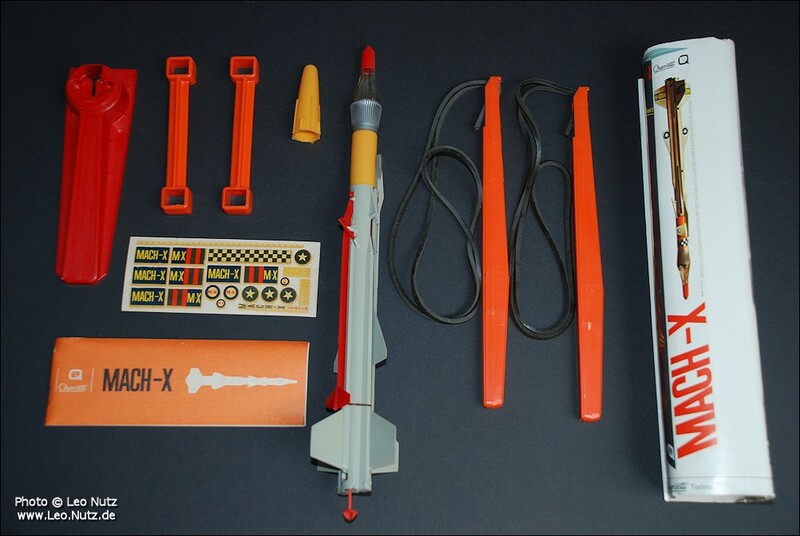 This kit was manufactured and sold in the 1960's. Thanks to Steve K. from Michigan, USA for the wonderful gift. 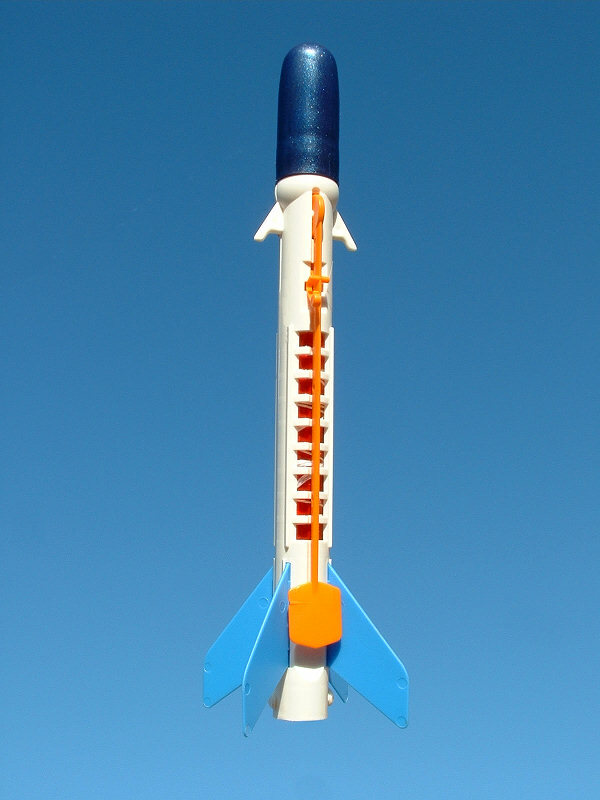 This is Quercetti's first issue model rocket toy manufactured in 1961. 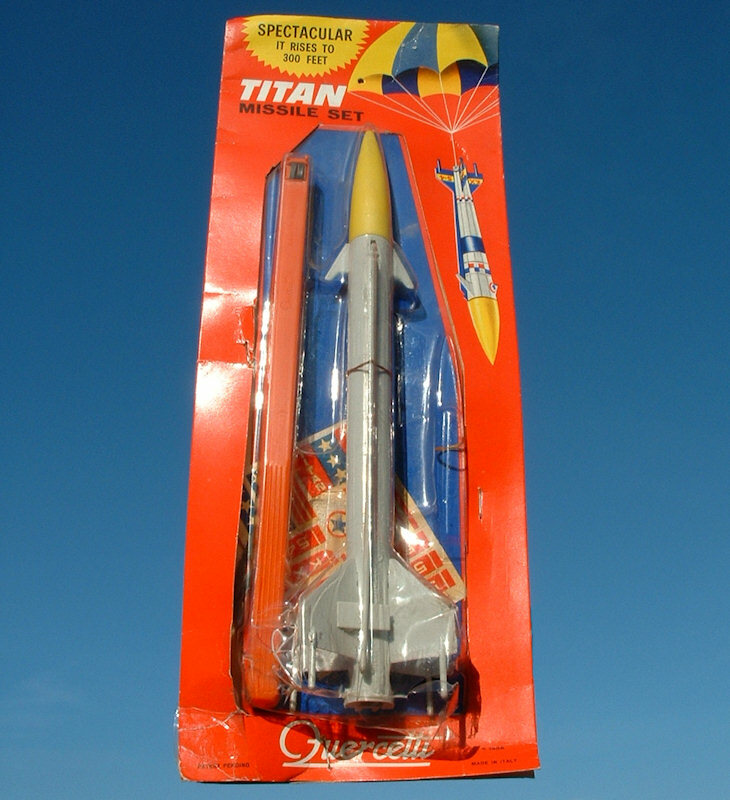 This is Quercetti's first issue model rocket toy manufactured in 1961 as German issue. 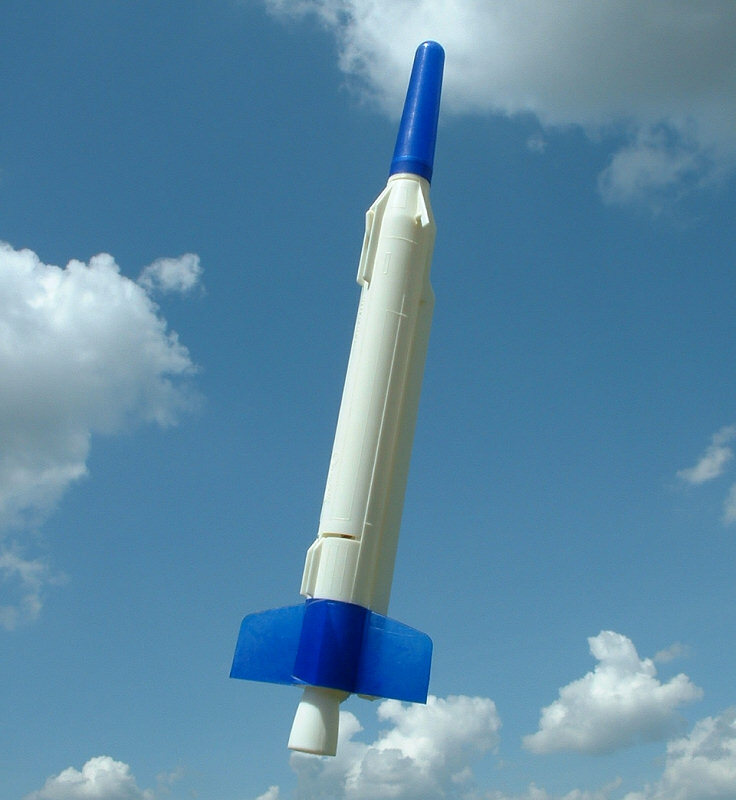 This is Quercetti's latest model rocket toy. Currently 10 users are browsing this web site, 628060 having visited since June 8th, 1997.